One of my favorite things to see is a delightful arrangement of flowers at a party. I especially like it if I had a hand in choosing the arrangement! After the party guests leave, I know that the flowers in the lovely arrangement will begin to droop and petals will start to drop off. But I’m happy to say that there ARE some things you can do to prolong the appearance of the cut flowers you incorporate into the decor of your party. Here is what you can do to help them to stick around a while longer to remind you of your fun gathering. 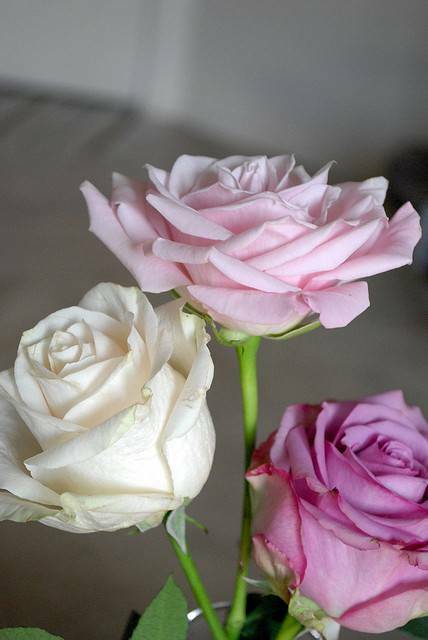 After you arrive home with your fresh flowers, take them out of their wrapping and examine the stems. Carefully remove any yellowing or torn leaves from each stem. These withering leaves can fall off into the water, causing bacteria to grow inside the vase. The next step is to trim the stems. Fill a small bowl with lukewarm water and find a sharp knife. Use the knife to cut off one or two inches of the stem while holding it underwater. Be sure to cut the stem at an angle instead of straight across. When a stem is cut underwater, that prevents a pocket of air from forming. An air pocket can stop water from moving up the stem to nourish the flower. I recommend that you use a sharp knife instead of scissors so you can make a clean, precise cut. A stem that tears or splinters becomes more vulnerable to bacteria and doesn’t last as long as a stem that is intact. One of the easiest ways to prolong the life of cut flowers from your party is to add flower food to the water. Generally, a small packet of flower food comes with any order of flowers. Follow the directions on the packet to get the best results. Alternatively, you may want to mix a small amount of bleach into the water in the vase. I suggest you add about a quarter of a teaspoon of bleach per quart of water. Bleach can prevent bacteria from growing in your vase. Another way to prolong the life of your flowers is to pour one part Sprite (yes, the soft drink) and five parts water into your vase. The acidity keeps the flowers fresh and the sugar provides them with food. Try to avoid the temptation of drinking from your flower vase when you need refreshment. It’s best to find a place for your flowers that is not exposed to direct sunlight. Also, don’t put them under powerful interior lights in your home. The strong light can hurt delicate blooms and leaves. Choose a cool area in your home where there is little chance that the vase will be knocked over or otherwise disturbed. Finally, you can trim the stems of your flowers every few days in an effort to keep them looking nice for as long as possible. Also, use a small spray bottle full of lukewarm water to mist the flower petals once a day. This helps to keep them looking fresh. I would also keep a sharp eye on the water in the vase. If it starts to look cloudy, dump out the water and replace it with a fresh supply.